A recent interview with Poison bassist Bobby Dall has strongly hinted at a joint tour between Def Leppard/Kiss and Poison in the US this summer. 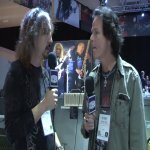 Although no specifics were given by Bobby during the interview Backstage Axxess who spoke to him at NAMM stated that his mention of a Poison summer tour is "rumored to be with Kiss and Def Leppard.". This follows rumours of shows with Poison, started by Bret Michaels last year. KISS were first mentioned (apparently) on US radio in January by a well known promoter who spoke of a joint tour. This is the first time all three bands have been mentioned together. There has been no further word from any Lep band member since Vivian's last tour update in early February when he said the dates would be announced "very soon". Poison were special guests to Lep in both 2009 and 2012. "Yes, we'll probably more than likely be going out this summer and playing 40 to 60 shows around the amphitheatres and different venues across the country." Anything you want to mention now? Would it be like a combined tour with other bands? OK So expect Poison on the road this summer in the US? "In the US and internationally."